Peroxynitrite is considered one of the major pathological causes of numerous diseases in that it suppresses mitochondrial functionand triggers cell death via oxidation and nitration reaction. Poor diets, environmental toxins, and genetic variants can all lead to an increase in peroxynitrites and glutamate, lowered antioxdants, and slower rebuilding and repair of cells, which causes faster aging and conditions for disease. 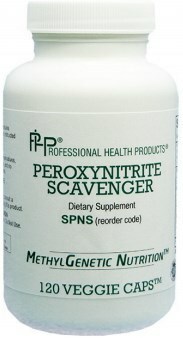 There is a list of genetic variants that increase the levels of peroxynitrite in the body and variants that reduce BH4 in the body and therefore create peroxynitrite. Useful for decreasing oxidative stress during evening and night time hours when brain inflammation is present.